Where to Stay in Montreal: Advice from a travel-writer and Quebec expert about the best neighborhoods to stay in Montreal, Canada! Disclosure: This Where to Stay in Montreal Guide contains affiliate links. That means we may earn a small commission when you use the links on this site to book a hotel, buy your travel insurance, etc.. You don’t pay anything extra. If you’d like to learn more about how this works, you can read more under our Disclaimer page. We created this guide in collaboration with Pamela MacNaughtan, the creator and editor-in-chief behind the fabulous Urban Guide Quebec, a hyperlocal guide website focused on Montreal’s smaller, old-world sister city. Pamela has served as the local expert for this post by outlining the best neighborhoods to stay in Montreal. Over time, I (Katie) will add in some specific hotel recommendations, as well as my own thoughts! Old Montreal (& Old Port): The most touristy area of Montreal, you’ll find lovely cobblestone streets, galleries, great patios and some excellent restaurants. Plateau Mont-Royal: Funky and bohemian and vintage all at once, Plateau Mont-Royal is an artsy Francophone neighborhood. Griffintown: Still a bit gritty around the edges, blue-collar Griffintown has been undergoing gentrification, and now has an industrial artsy vibe. Mile End: Technically part of the Plateau Mont-Royal, Mile End is 10 blocks of trendy boutiques, cafés and restaurants. Mile Ex: A relative newcomer amongst Montreal’s trendiest neighborhoods, Mile Ex has some of the hippest spots in the city…and that’s saying a lot. The Village: Montreal’s Gay Village is welcoming to all, and is the place to stay if you want to be in the center of the party. Saint-Henri: Laid back and peaceful Saint-Henri is the spot to stay if you want somewhere tranquil and residential. Beautiful Montreal. Photo by Maxim Polishtchouk used with a CC Zero License. Montréal is vibrant and loud, classic and historic. It is a cosmopolitan city with enough French flair that one could easily forget they are in Canada — a characteristic that many French-Canadians are proud to project. This is the city people flock to when they are looking for excitement, laughter, delicious food, art, fashion, and memories that will last a lifetime. Over the years, I have transitioned into a passionate francophile, and while I chose to live in Québec City, I ventured into Montréal on a monthly basis to explore and eat and shop and soak up as much vitality as I possibly could. I chose to live in Québec City because it is quiet and charming and feels like a snuggly boyfriend. Montréal, on the other hand, feels more like a wild passionate love affair that will penetrate every single inch of your body. During the day, I am often exploring a neighbourhood or two: shopping in boutiques, sitting on a café patio sipping a tea and nibbling on a buttery croissant, looking for new bistros or pâtisseries to try, admiring the neighbourhood architecture — especially the houses with the long wrought iron staircases in Mile End. Once the sun goes to sleep, I hit up a local micro-restaurant or bistro for dinner and then a night filled with wine bars or dance clubs or outdoor art exhibits or crazy festivals or all of the above. Heading to Quebec City or Toronto on This Trip? 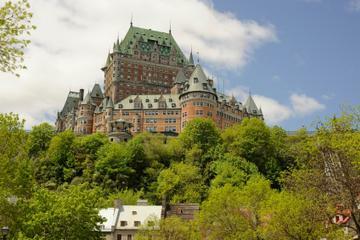 Check Out Where to Stay in Quebec City, and our Where to Stay in Toronto guides for the best areas to stay. Most people arrive by train or plane, and a few by bus. While the airport is not anywhere near the city centre, the train and bus stations are. Montréal-Pierre Elliott Trudeau International Airport is located about 19 kms (12mi) from the city centre. If you’re arriving my plane, take bus 747 from the airport (about $10) to Berri-UQAM metro station, then on to wherever you are staying. The bus runs 24/7, and the trip typically takes 45 to 75 minutes. You can also take a taxi (about $40) or the train ( about $23). Book a private airport transfer here. There are a couple of bus options when traveling to Montréal, especially from Toronto. The most popular is Mega Bus which has several Toronto-Montréal (about $27) departures each day. The stop in Montréal is in the city centre, and within walking distance of the métro. Using the métro in Montréal is quite easy. A single ride will cost you $3.25, however you can also buy a day pass ($10) or a weekly pass ($25.75). If you’re planning to explore a neighbourhood in spring, summer, or fall, consider skipping mass public transportation and using a Bixi bike to cycle through the city (about $5 per day or $30 per month). Montréalers love all things active and outdoorsy! The 72 hour Montreal Attraction Pass gives you access to 23 of the city’s attractions including Au Sommet Place Ville Marie where you can get a bird’s eye view of the city from 185 meters up (600+ft). Also included are two different riverboat cruises, museums and unlimited use of public transit during the 72 period, including the airport shuttle. While Vieux Montréal and Vieux Port (Old Montréal and Old Port) are two neighbourhoods, but as they are side by side, they are often clumped together. This is where you will find the majority of the tourists in Montréal, but that doesn’t mean you should avoid this area all together. On the contrary, you should definitely find a little hotel room and spend a couple days exploring Old Montréal. Wander down the old cobbled streets and window shop in the many antique shops and art galleries, enjoy the sunshine on a patio, admire outdoor art installations, take copious amounts of photos, and go to my favourite place in the neighbourhood, Bar à Beurre for a salad and then some mind blowing desserts. Many of the shops in this area are souvenir oriented, so save that for another neighbourhood. Restaurants like Olive & Gourmand are delicious, but way too busy. Consider making reservations for dinner at Le Bremner or Auberge Saint-Gabriel. Then cap off the night by hoping your way through the various pubs and wine bars in the neighbourhood. LHotel – Beautiful 19th century building with antique furniture throughout, and even an art gallery. Hotel serves daily breakfast, and is well situated within walking distance to the metro and many shopping and restaurant choices. Auberge Bonaparte – Located a short walk from the Notre Dame Basilica, the hotel includes a daily breakfast to get you going and has a restaurant for lunch and dinner on-site. A short walk to the metro makes this a great spot to enjoy the city from. Hotel Epik – Cool modern design in a historic building. There is a coffee shop in the lobby and within minutes of a metro station, as well as the many shops and restaurants of the Old Port. Note: no elevator. Hotel Nelligan – Steps from the Notre Dame Basilica and many other attractions. Bar and restaurant on site with a rooftop terrace, fitness facility and spa, and concierge service. Walking distance to the metro, a very well liked hotel. W Montreal – The hotel has several lounges on site, a fitness facility and spa, tasteful rooms with comfy down duvets. Very well located close to Notre Dame Basilica, the Old Port , the World Trade Centre, Place des Arts as well as the metro. Embassy Suites by Hilton – Well located within walking distance of Notre Dame Basilica, the Old Port, Place des Arts and the metro. Includes a daily cooked to order breakfast, as well as an evening drink from the bar. Hotel Gault – A contemporary boutique hotel with nice touches like a heated bathroom floor. The hotel has a lovely library with a fireplace to relax in. Very close to Notre Dame, and the Old Port. Hotel Place D’Armes – A very well liked hotel with cozy rooms with bathrobes and a minibar. Fitness centre and spa on-site as well as an a Japanese restaurant, lounge and a rooftop terrace. Intercontinental – This hotel features an indoor saltwater pool, sauna and spa, and fitness facility. There is an on-site restaurant and the hotel is conveniently located across from the underground city, and walkable to the Old Port and Notre Dame. Since Mile End is part of the Plateau Mont-Royal, old style stone duplexes with black wrought iron staircases are a part of the neighbourhood’s character; as well as cafés, designer fashion, and delightful bistros. It is funky and vintage and bohemian and yuppie. And I absolutely love it. Plateau Mont-Royal is a francophone community consisting of students, artists, young families and a slathering of foreign cultures and languages. Relaxing in a café, admiring stunning street art, eating some of the best food of your life, and drinking the night away are just a few of the things you will do while you’re hanging around in the plateau. Start your time by devouring the best smoked meat sandwich you will ever eat in your life at Schwartz’s Deli — another Montréal institution. Wander to Pâtrisserie Rhubarbe for something sweet and delicious (I’m hungry just writing about this). You will love the carefree vibe of Plateau Mont-Royal. It is easy to plant yourself within the neighbourhood and not venture into others, as everything you could possibly need can be found here. Casa Bianca – A small 5 room B&B located across from Mount Royal Park. All rooms have private bathrooms with amenities, and the hotel features a terrace and a shared kitchen. Le Metro Mont Royal – 3 bedroom, self catering apartment with a full kitchen, a terrace with city views and just steps from the Mont Royal metro station. Great for a family or larger group, or a longer stay. Couldn’t find any reviews on trip advisor, but well liked on Booking.com. Montreal is beautiful in the winter too! A little gritty around the edges, over the last five or so years Griffintown has been going through a gentrification process that is bringing both locals and visitors, back to the area. Griffintown, the oldest blue-collar neighbourhood in North America, is now home to celebrity-chef restaurants, cool cafés, posh boutiques, art galleries, and bars with an industrial vibe. Dine at Griffintown Café (which happens to have a killer brunch) and grab a sweet treat from Itsi Bits Cupcakes or try Filipino cuisine at Junior. While it is technically a little outside Griffintown, a meal at Joe Beef is highly recommended — although you may want to eat salads for a day or two afterward as the food is delightfully rich. I love spending time in Griffintown, wandering the streets and looking for unique places to instagram, eating way more food than I possibly should, and admiring local art. A great neighbourhood that still feels local, as most tourists have not discovered how cool it is — and frankly, that is a very good thing! Hôtel Alt Montréal – Eco-friendly, and has a fitness center on-site. Rooms have a coffee machine and toiletries, and there is a snack bar in the hotel. It gets great reviews, definitely going for the boutique designer feel. Montreal Marriott Chateau Champlain – More of a business vibe here. It has a fitness area and offers concierge services. Within walking distance to the underground city and many other bar and restaurant choices and very close to the metro. Fabulous things come in small packages, and Montréal’s Mile End is no exception. Technically a part of the Plateau Mont-Royal neighbourhood, Mile End is ten blocks of delicious food, cafés, trendy boutiques, art and culture. In other words, it is mecca for hipsters and artists and foodies. The first thing you will need to do is buy some famous Montréal bagels. There are renowned bagel shops in Montréal, and both are in Mile End: Fairmount and St-Viateur. While I prefer Fairmount bagels, many would disagree with me, and many would agree. You will need to try both and discover the truth for yourself! The Sparrow is my favourite spot for brunch — and if they are serving salmon eggs Benedict, you best order it and prepare to have your mind blown. So good. And the perfect solution after a night of partying. Beauty’s Luncheonette is another favourite, and a Montréal institution since 1942. And one cannot forget Wilensky’s Light Lunch! Once your hangover is under control, wander around Mile End and shop at boutiques like Annex Vintage and Boutique Unicorn (because, UNICORN!). And don’t forget to snap photos of the houses with the long wrought iron staircases and whatever else catches your eye. Three Bedroom Apartment – On the third floor of a quiet three storey walk up, one of the bedrooms has a queen, one has a double bed, and the other very large bedroom has four separated twin beds. Big, bright fully equipped kitchen with all the amenities, coffee maker, toaster, blender, dishes and cookware, etc. Past guests have commented on the good information/recommendations left in the apartment by the host. Paid parking available in front of the building, 10-12 minute walk to the metro, lots of restaurants, shops and services right outside the door. ~$130US/night (more during special events). Two Bedroom Apartment – This is a lovely, fully renovated apartment-style condominium, 2 bedrooms, each with a queen size bed. You’ll find all houseware amenities you can think of, fully equipped kitchen, linens, towels, cable/satellite TV, air-conditioning, etc. The apartment has two terraces, including a rooftop terrace where you can enjoy meals, or soak up some sun! The area has many restaurants, shops and services close by, the metro is a 10 minute walk but there are bus options closer by if you choose. 2 night minimum stay, ~$120-$150US/night. One Bedroom Apartment – A modern apartment style condominium with beautiful hardwood floors, a balcony and large windows. The one bedroom has a queen size bed, there is both a washer and dryer in the unit, and a fully equipped kitchen. You’ll find a Nespresso machine, dishes, cookware, and towels and linens are provided. The owner says a storage locker can be made available for longer stays. Lots of bar and restaurant choices in the area. The metro stop is a 5-7 minute walk, Car2Go is a good option if you subscribe. Minimum 2-night stay ~$97US/night. While many big name hotels are located downtown Montréal, few people actually spend their time there when visiting the city. Vieux Montréal (Old Montréal) and Vieux Port (Old Port) are the most popular among tourists — a beautiful area of the city that should be seen by all. However, once you have hit up the tourist hotspots, I highly recommend exploring some other neighbourhoods. This is where you will truly get a sense of life in Montréal. Each neighbourhood is distinct, and while some may not be accommodation-friendly, they are still worth checking out. Smaller than Mile End, Mile-Ex is the newest hip/trendy neighbourhood in Montréal. Located near Little Italy (which you should also check out) and Marché Jean Talon, a visit to Mile-Ex is not complete until you have dined at Restaurant Mile-Ex with its communal tables and L.A. street food vibes —with a touch of Southern France elements. Or pop by Dépanneur Le Pick-Up for some Québec comfort food. If you’re looking for a cool bar to hang out, check out one of the best hipster bars in the city, Alexandraplatz, or the micro-bar Le Ritz PDB. For the Mile-Ex neighborhood, we’d suggest checking out HomeAway, VRBO, and – of course – Airbnb to find a holiday apartment. There is a large inventory of amazing holiday apartments to be found in Mile Ex. One Bedroom Apartment – Basically this apartment is located at the confluence of Mile End, Mile Ex and Little Italy. A 9 minute walk to the metro, 15 minute walk into Mile End. The building has a lift, bedroom has a double bed, linens and towels are provided. Full kitchen, air conditioning, and laundry in the apartment. Lot’s of restaurant options around, close to many services. Clean, bright and modern 3 night minimum stay, ~$75US/night. Two Bedroom Apartment – Again, no reviews yet, the apartment style condo is managed by a professional company, and looks to be fairly nice with very modern kitchen appliances, and good quality furniture. Fully equipped kitchen, air-conditioning, linens and towels are provided, parking is available (likely for a fee). There is a double bed in one bedroom and a futon that folds down into a second double bed if needed in another bedroom. A 10 minute walk to two different metro stops, bars and restaurants and nice shops are very close by. 2 night minimum stay, ~$89US/night but fluctuates considerably depending on the season. Montréal’s Gay Village is one the location of the best party in the city, whether you are gay or not. Spend the night dancing at places like Sky, then venture out to a couple after-hours clubs before ending the night/early morning eating hot gooey poutine. If you want some entertainment with a Québécois flair, check out a cabaret show. The largest gay village in North America, the Village is a mixture of century-old triplexes, street art, patios where you can soak up the sun while drinking a beer, fashion boutiques, and outdoor art instillations. And one cannot forget the annual Pride parade. Le Relais Lyonnais – Conveniently located on Rue St Denis with loads of restaurants nearby, walkable to Old Montreal, Place des Arts and Notre Dame Basilica. The hotel features an on-site restaurant and rooms with a desk and fridge. Auberge Le Pomerol – Located very close to the metro, but still walkable to the Old Port and Basilica Notre Dame. Clean, tasteful and comfortable rooms with coffee makers and continental breakfast delivered to your door each morning. Hotel Visitel – Clean and basic, but everything you need. Steps from a metro station with most attractions just a few stops away. Lot’s of restaurants within a few blocks. Note, no elevator. While Mile-Ex and the Village are vibrant and electric, Saint-Henri is laid back and quiet. Located near Little Burgundy, Saint-Henri has a distinct residential vibe, but that does not mean you should skip it. On the contrary, I highly recommend staying in this area of Montréal if you are looking for a more relaxed visit. Explore Marché Atwater and buy copious amounts of Québec cheese, baguettes, fruit and whatever else tempts your eye, and have the best picnic of your life. Do a little shopping alone rue Notre-Dame Ouest, then stop by Rustique pies for a little dessert. So good! There are plenty of restaurants to choose from in Saint-Henri, but I highly recommend Tacos Victor and Ludger. Two Bedroom Apartment – Located on a nice, quiet street, bright and spacious with a recently renovated master bathroom. A full and nicely equipped kitchen with everything you’ll need. One bedroom has a queen bed and the other has two twin beds, a crib is also available if needed. Located near nice parks, and recreation centres, Lachine canal is great to rent a Kayak, or for a pleasant stroll or jog. Atwater Market is a 15 minute walk, but conventional grocery stores are closer, about a seven minute walk to the metro stop and downtown is just 4 stops away. Saint Henri has lots of great restaurant choices very close to the apartment. A minimum 3-4 night stay ~$85-$125US/night (low-high season). Three Bedroom Apartment – Recently renovated to a very modern style inside of a classic 19th century building. High quality furnishings and decoration, a fully equipped kitchen with a gas stove and all appliances, air conditioning, washer and tumble dryer, and linens and towels are provided. Upstairs there are three bedrooms and a full bathroom with a tub and shower, one bedroom with a queen bed, one with a double and one with two twin beds. Downstairs, there is another full bath with a standing shower and a futon that folds out for another guest if needed. A 4 minute walk to the metro stop, some nice parks, restaurant choices and shops just down the street. A minimum 3-5 night stay ~$115-$150US/night (low-high season) based on 4 guests. One Bedroom Apartment – One bedroom with double bed, but here is a foldout futon in the living room. Full kitchen with all the necessary appliances and in-suite laundry. A large private terrace with a grill for some delicious BBQ, close to grocery stores, and boutique shops, and the Atwater market is just a 10 minute walk. The apartment is just a few steps from the Lachine canal with a beautiful waterside walkway and cycle path, or rent a bicycle, kayak or pedal boat in the summer. An 8 minute walk to the metro, and just 4 stops to downtown. A minimum 2 night stay ~$71-$105US/night (low-high season). So Where Should You Stay in Montreal? Where you stay in Montréal depends on which vibe you prefer. The Village is a party that goes until dawn, while Mile End is artsy and trendy and eclectic. Plateau Mont-Royal is filled with young professionals and families and students and artists; there are healthy amount of cool cafés, locally owned bistros, and hop boutiques. Griffintown is gritty and industrial, but well on its way to being a hip and funky neighbourhood for both locals and visitors. 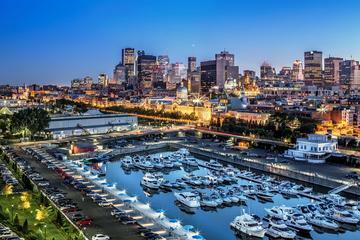 Old Montréal and Old Port are touristy, but a place everyone needs to visit. Mile-Ex is new and hip and still evolving — and I’m told there is a fab barber there that make all the bearded Montrealers go gaga. Montréal, in general, is a safe city. The parties rarely stop before dawn and there is almost always a café or restaurant open somewhere to help you take the edge off your evening. In the summer the city hosts popular festivals like Just for Laughs, and in the winter everyone comes out at night to party for Igloofest — the biggest DJ’ed outdoor party in the coldest month of the year. Montréal is home to Québec’s fashion scene, as well as home to several celebrity-chef restaurants. And there are so many cafés in the city that it would take you months to visit all of them. While you do not need to speak French to visit Montréal, it is best not to assume that everyone speaks English, because they don’t. Smile, be polite and make an effort to speak French, the locals are usually friendly. I hardly speak French, and I get by very well in Montréal (and while living in Québec City). Enjoy your time in the city. Walk until your feet hurt and then switch to a Bixi bike or public transportation. Eat as much as you can and do not forget to have poutine, bagels and a smoked meat sandwich. Party in the Village until the sun comes up. Shop in the farmer’s markets. Admire all of the street art. And remember, what happens in Montréal, stays in Montréal. Did You Know? Hotel referrals and online shopping are a primary source of income for this website. By making your hotel bookings using the links in this website, you support our continued efforts to bring you the best travel information. It’s as easy as booking your hotel through Booking.com, Hotels.com, HotelsCombined or TripAdvisor … or doing your Amazon shopping through this link … and it doesn’t cost you anything extra! Hello. Im looking for a long term rental beginning of October 2017. It may be sooner depending on what the new American government does. Need to be near a hospital/dialysis center (in case I need dialysis in my future) Anyway I’m by myself. No pets, single. I am disabled but manage on my own. Hope to hear from you. Thank you so much. Hope this helps, and good luck on your search! Hi! My friend and I are doing a short three-night girls’ trip in early February. We are hoping to enjoy a spa one day, and then explore the city the others and enjoy some delicious dinners. Any suggestions on where to stay? We won’t have a car, and are two girls looking for a fun area in a safe neighborhood. Thanks! Have you decided on a spa yet? If not, one option is the Scandinave Spa – I haven’t been to the Montreal location, but I have been in Whistler, BC, and it was excellent. There are indoor, typical spa things, as well as outdoor plunge pools ranging from hot to cold. It was lovely! That spa is in Vieux (Old) Montreal, which is probably your best bet for accomodation and a nice, walkable experience all round. We’ve just updated the blog post (above) with some specific recommendations, but I’d suggest The W Montreal or Hotel Nelligan would be a nice option, and both are in Old Montreal. The W has it’s own on-site spa as well. If you have a specific spa in mind, let us know and we can possibly recommend some places nearby! Was recently in Montreal and stayed at the Hotel St. Paul right on the edge of Old Montreal. Was incredibly convenient to that part of town (literally right around the corner), plus recently joined SPG’s Design Hotel collection. The hotel is admittedly so-so on the service, but is beautiful in terms of looks (very modern) and location in tops! Hi, We are thinking of coming to Montreal and Quebec city in April 2017 by plane. should we visit both cities and what would you recomend to do 2 adults and a son who is 12.also is there a train between cities. Thank you! Great to hear from you. To answer your questions: 1) yes, you should visit both cities! They are quite different in character, but both very nice. 2) yes, there’s a train between the two cities. The train company is called VIA Rail, and you can find schedules on their website. Montreal: If the weather is nice, you can rent bikes and ride along Lachine Canal; Montreal has ghost tours that might be fun; the Botanical Gardens also have a Insectarium which could be interesting if your son likes nature and bugs; there is a good science centre in Montreal as well. This, of course, is in addition to enjoying the old town, the public market, and the main tourist attractions. HI, Do you know if Montreal is a bike friendly city. We would rent our bikes but we have a 3yo son who will be with us so we were thinking about bringing our own bikes. This blog seems to be dedicated to cycling travel, and lays it all out quite clearly! We hope this helps, and enjoy your trip! Hello- I just found your blog.. I will be visiting montreal with an infant this september, and would like to walk down to restaurants, and coffee shops because I will not be renting a car. Please give me suggestions on whether I should choose downtown or old montreal. Thanks in advance. My original thought is Old Montreal, and perhaps bring a baby carrier so you don’t have to worry about a stroller on cobblestones! But I thought I’d check with Pamela as well. 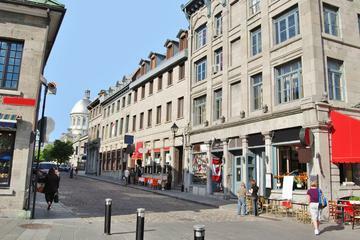 She also recommends Mile End or Plateau Mont-Royale, which have plenty of cafes, great restaurants and very walkable. The south of Mont-Royal is close enough to Old Montreal and Chinatown. I hope this helps, and enjoy your travels! Any recommendations for a food tour in Montreal? A couple of ideas for you! 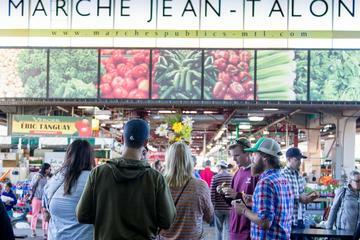 We have heard the Marché Jean Talon tour with Context Travel is good. It’s with a chef, and focuses on local ingredients and flavours. Link here: https://www.wandertooth.com/53in. If you’re interested in something else, we found a few tours on on Viator that get good reviews. There are some general food tours, and also some more specific ones (themed around wine, chocolate, craft beer, food trucks, etc). I hope this helps!!!! Hi! My 2 girlfriends and I are flying in 2 weeks. We’d like to be in a walkable area of the city, close to metro/train, but with great food and things to do, and safe. We’d like to walk most places. We are 29-32 without children, so we aren’t looking for a place that is full of children. What areas of downtown would you recommend, I know you mentioned that could be tricky. I’ve also been looking in the Old Town. Open to a hotel that is boutique too. Budget is ideally less than $300/night. Thanks! I would suggest Old Montreal, if you want to be right in the thick of it, or Mile End or Plateau Mont-Royale if you want to be in a more neighbourhood-y area :) Plenty of cafes, great restaurants and very walkable: The south of Mont-Royal is close enough to Old Montreal and Chinatown in terms of convenience. If you stay in Mile End or Plateau Mont-Royale, there are fewer hotels to stay in. You can check out VRBO for apartments, or something similar. I hope this helps and enjoy your trip!